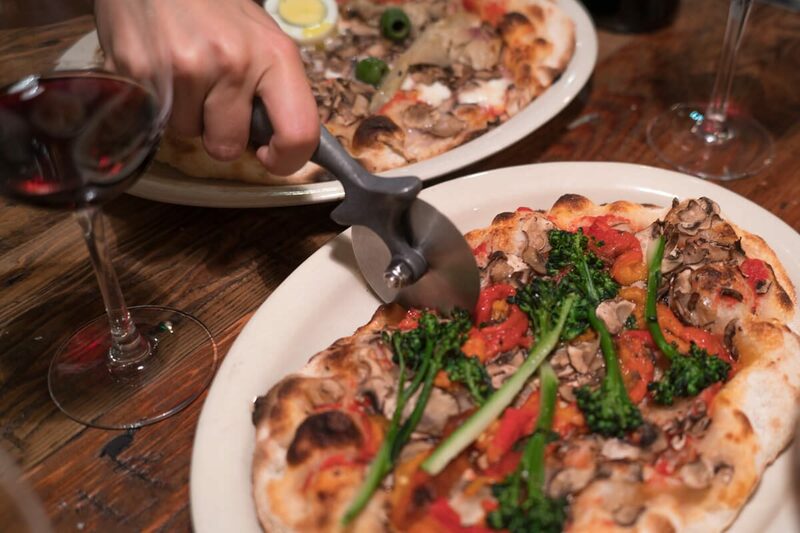 On our last trip to Italy, Chiara Lima of Mamma Agata’s cooking school recommended that we venture to see Franco Pepe at Pepe in Grani for the best pizza in Italy. We did not have a car and Pepe in Grani was about 100 kilometers from where we were staying, so we put it on our to-do list for our next trip. Fortunately, we didn’t have to wait too long to try the renowned pizza. 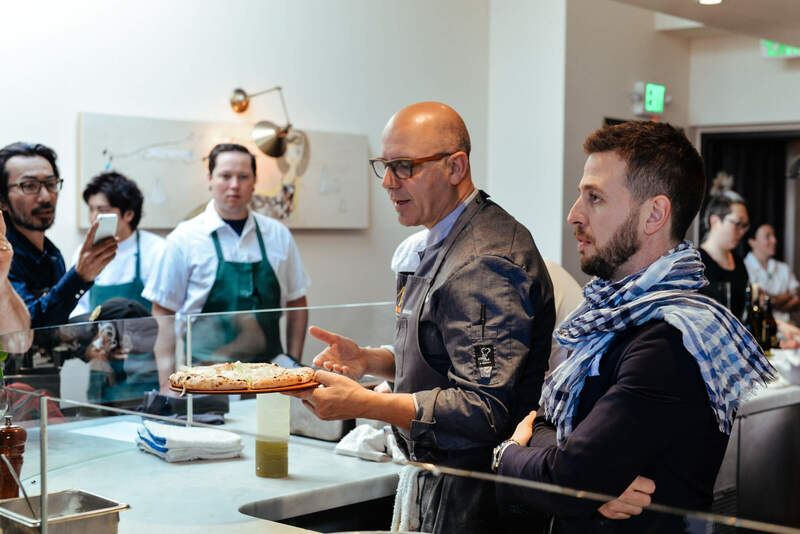 A16 Rockridge recently hosted a master class with Franco Pepe. In addition to bringing his expertise as a pizzaiolo, he also brought his own specially milled flour, yeast, and water. 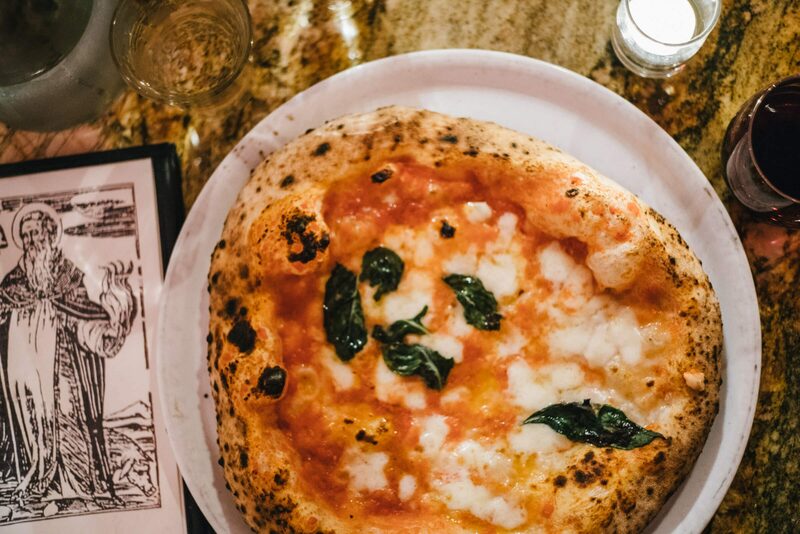 Chefs from around the Bay Area gathered at A16 to learn the art of Neapolitan pizza from Franco Pepe. The third-generation pizzaiolo lives in Caiazzo outside of Napoli. He is constantly researching and experimenting in his pizza laboratory. Drawing on traditions, but with no rules and no recipes, he crafts exquisite pizzas with light and airy crusts. Pepe in Grani is based on a hyper-local concept. 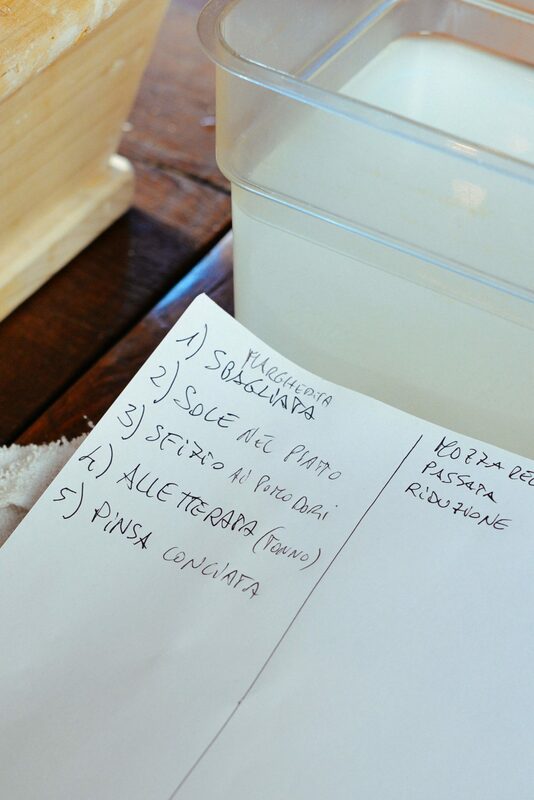 Every ingredient served at the pizzeria comes from a 4 kilometer radius, is seasonal, and made by hand. He told us that he has tried mechanical ways of mixing in his experiments, but there’s something about mixing with his hands that makes a difference. Franco mixes every batch of dough by hand in a wooden box, kneading until the dough is the perfect consistency. It’s important to Franco that pizza be nutritious, easily digestible, and flavorful. His technique is largely responsible for these qualities, but he has also developed a special blend of flour made with a revived ancient grain regional to the area called Autonomy. Don’t go looking for it online; this proprietary grain is available only to him. While listening to his story and learning the intricacies of his process, we were all treated to a beautiful spread of cheese, charcuterie, salads, and wine, provided by Shelley Lindgren and the A16 team. Franco has been associated with Michelin star chefs and featured in Italy’s famous gourmet magazine, Gambero Rosso along with many other accolades. 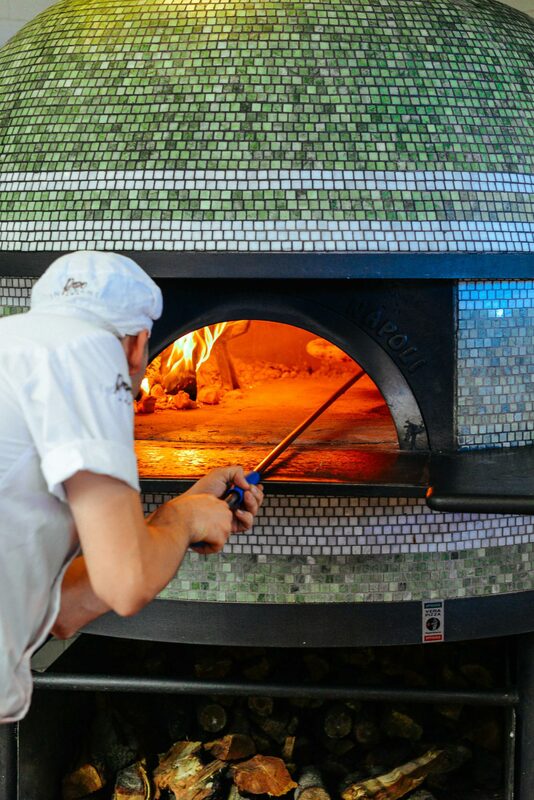 Historically, a pizzaiolo had a humble role, but Franco Pepe has elevated the art of making pizza, and through innovation and research, helped to professionalize the industry. He is rightfully regarded as the best pizzaiolo in Italy, creating probably the best pizzas in the world. After explaining to the group his process, he served five different pizzas, all personally hand-made in front of us. He started with his famous Sbaglita Margarita, a deconstructed traditional pizza margarita (what we tend to judge all pizzerias by). This included purees of basil and tomatoes. This was followed by Sole Nel Piatto with fried basil, anchovies, tomatoes, and olives. Next was the Sfizio ai Pomodori, topped with sun-dried and fresh cherry tomatoes. Our unexpected favorite was the All Terata with a base of onion cream and topped with tuna, mozzarella, and celery that had been “cooked” by placing the thinly shaved pieces into an ice bath to curl, similar to what you might do with puntarella. He finished with a fantastic Pinsa Conciata, an ancient combination of toppings that included fig conserve and black pepper. 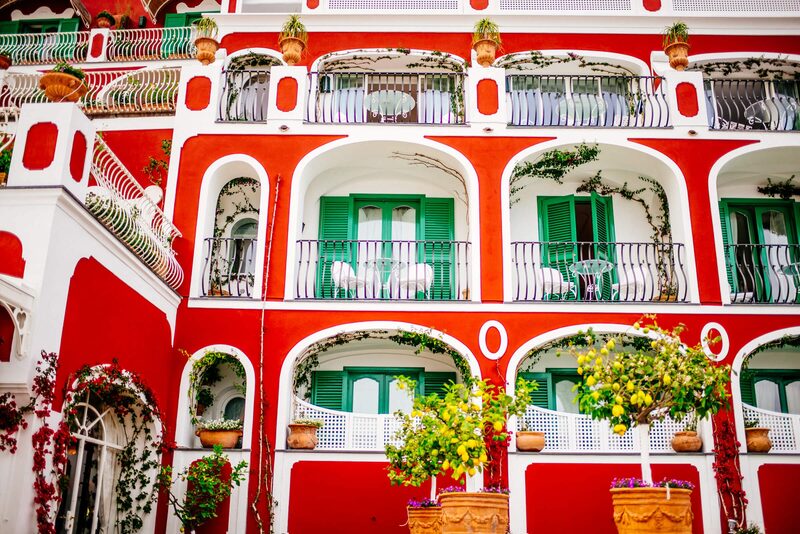 Pepe in Grani is on our must-do list for our next trip to southern Italy. We can’t wait to see Franco Pepe in his own kitchen! 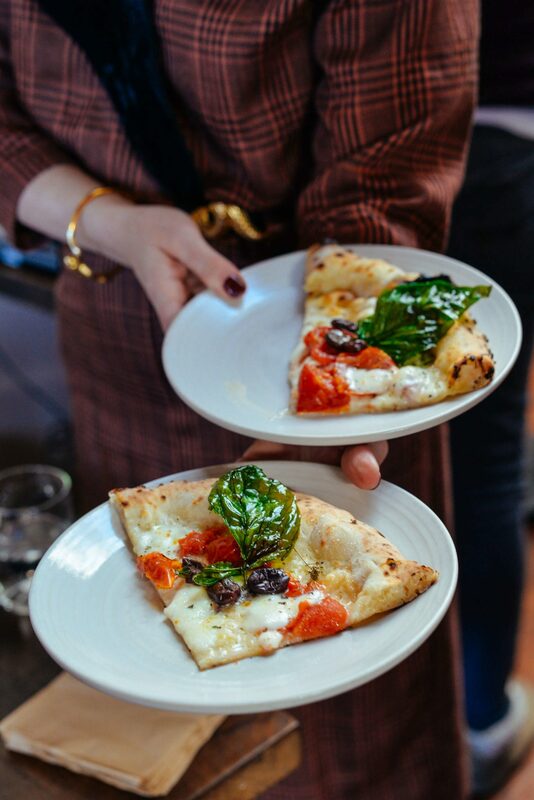 While we’re in San Francisco, we love a good pizza from A16! If you aren’t in Italy or the Bay Area, check out A16’s cookbook. It’s one of our go-to cookbooks. What a fabulous post! It felt like I was right there with you watching him make pizza and tasting all the fabulous ingredients. Bravo to Pepe in Grani and to The Taste for such a wonderful pairing! I really enjoyed viewing this post, loved everything about it! I want to live in the city! Looks great. Simple clean great tasting food. Marvelous! Grande Franco. Molto bello il servizio e le foto. Ci rivediamo presto.